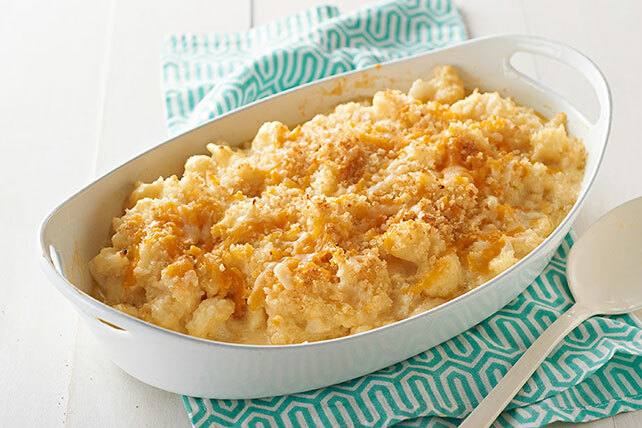 Replace macaroni with cauliflower in our twist on a classic Mac & Cheese. Our imposter pasta is sure to become a new family favourite. Cook cauliflower in boiling water in large saucepan 4 min. ; drain well. Melt 2 Tbsp. margarine in large saucepan on medium heat. Add onions; cook and stir 3 min. or until crisp-tender. Stir in flour and mustard; cook and stir 1 min. Whisk in milk; cook 5 min. or until thickened, stirring frequently. Remove from heat. Add 1-1/4 cups cheddar and 3 Tbsp. Parmesan; stir until cheddar is melted. Add cauliflower; stir to evenly coat. Spoon into 2.5-L casserole dish sprayed with cooking spray. Microwave remaining margarine in medium microwaveable bowl on HIGH 30 sec. or until melted. Stir in bread crumbs and remaining Parmesan; sprinkle over cauliflower mixture. Bake 20 to 25 min. or until heated through, topping with remaining cheddar for the last 5 min. For added flavour and texture, stir 1/4 cup Oscar Mayer Real Bacon Bits into cheese sauce before adding cauliflower.